When the Clapper showed up on late-night infomercials, the way we turn lights on and off was revolutionized forever. the iOn has a similarly game-changing purpose: to change the way we switch our lights from on to off and back again. 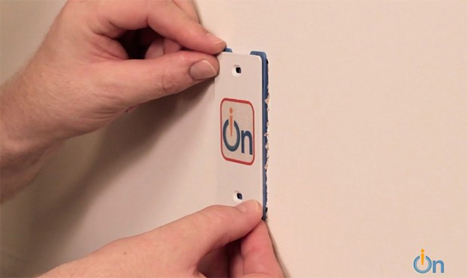 Arguably a little less convenient than the Clapper, the iOn can change any light switch into a touchless capacitive switch that you have only to wave your hand in front of. The iOn works with the same technology that touchscreens use: capacitive sensing. But you don’t have to actually touch the iOn to make it work; you only have to wave your hand in front of it. That’s because its capacitive field is much larger than the typical touchscreen. The iOn even lets you put a conductive object into its capacitive field to extend its reach. A metal statuette, a decorative item, or even a fishbowl can become your light switch. Replacing your current mechanical light switches with iOn is simple, as you can see in the product’s Kickstarter video above. It can be installed flush against the wall or even inside of the wall so your houseguests will be utterly stumped when they try to find the light switch in the middle of the night. Custom plates can be installed over the iOn to personalize the system and give a visual clue as to the whereabouts of the light controls. The iOn doesn’t only control lights; anything with an on/off switch in your home can be converted. Some of the examples given in the Kickstarter pitch are ceiling fans and whirlpool bubblers. But one of the most interesting features of the system is that it can be controlled remotely via a smartphone app. You can switch lights on and off or create a random switching pattern when you’re away from home to fool any wiley characters in your neighborhood. See more in Digital Design or under Technology. March, 2014.